'Tis the time in this series to talk about E.T.! Well, yes, it does seem to be modernities preferred explanation for everything strange and unknown. I've never seen a UFO and I wandered the boonies all night long for near 7-years...Notta! And I saw many incredible things in the night sky but everything I saw was natural; I've never seen E. T. either. I have had numerous spiritual experiences, though, but I've been able to distance myself from them and try to analyze them from a non-biased objective position ( as much as this is possible). For me, it's the ancient megalithic architecture that offers clues to some other intelligence involved on earth because Iron/stone age humans didn't build these things all over the earth. So whatever E.T. is it was somehow involved in the creation of these structures which all seem to date back to around 12,000 years ago (so much for Biblical historicity). Of course, there is endless anecdotal evidence but I view that as not much different from religious anecdote: it doesn't amount to much proof of anything and moreover, the anecdotes couldn't be more diverse, confusing and contradictory. I've quipped in the past that if all this was the work of angels then they are the most confused beings in the universe--E.T. theory doesn't fare much better. If it ends up being true it would mean to me that the universe we are in is extraordinarily convoluted; that God doesn't exist in any conventional sense, and that from humanities perspective it's best to view God as an alien extraterrestrial of some sort--the Starseed theory. There are a few theories I like more than others: the one where an E.T. 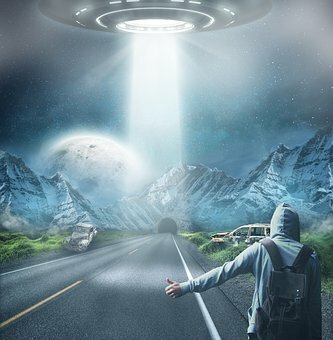 race got stranded on earth and they were also responsible for human DNA manipulation; this race of E.T's has one general goal: to get their technology back so they can escape this planet again. This seems to be the Atlantis/Lemuria theory, and concomitant with this theory is the notion of myriad alien races--many of them involved here on earth. Nag Hammadi describe two groups of archons: the greys of popular culture and the reptilians. The Anu seems to be in cahoots with both these groups. The Anu being the Biblical Jehovah--the Gnostic demiurge who controls this earth. Either one of these theories points towards a conspiracy of elites who are keeping any truths on this matter hidden to the general population. One aspect I find intriguing is these theories allude to the possibility that the earth's academies are all coordinated in two primary ways: to conceal the truth and to a commitment to re-acquiring lost technology. I have a personal quibble with the earth's academies in that they are the one group of people I'll lay blame on if civilization collapses because they should have known and done better! This particular theory is a somewhat coherent theory of why the academies are culpable and endlessly corrupted by the corporate machine and its machinations. I'll touch on Buddhism and Crypto and offer what I consider Golden Rule economics as a solution to civilizations woes as I wrap up this series of twelve posts. The starseed makes sense especially when you think of the fallen "angels"
In the meantime, is your comment suggesting that premodern religionists were really describing​ and encountering alien beings? I would definitely consider doing that. And, Yes that is what I was suggesting. When I read the title, I thought about Leonardo Da Vinci Golden Ratio, where nature tends to repeat certain patterns according to mathematical series of ratios. Fascinating post!